Ready, Set, Freeze: Japan Prepares To Switch On Fukushima 'Ice Wall' : The Two-Way Japanese regulators say an underground refrigeration system at the nuclear power plant can be activated. The facility was damaged five years ago, and the ice wall is a year behind schedule. Employees work on the construction of an "ice wall" last month at the Fukushima Dai-ichi nuclear plant. March 11 marked the fifth anniversary of the magnitude-9.0 earthquake and tsunami that caused meltdowns at Fukushima. Five years after an earthquake and tsunami damaged the Fukushima Dai-ichi nuclear power plant, Japanese authorities say a long-planned "ice wall" around the leaking facility can be turned on. The underground refrigeration system that should create the frozen barrier was completed last month — more than a year behind schedule, The Associated Press reports. 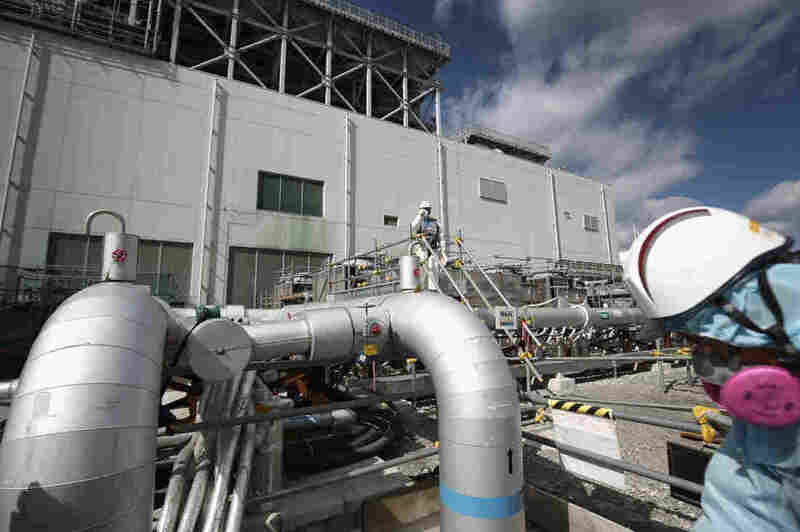 Freezing will begin "shortly" and will be carried out in phases, according to the Tokyo Electric Power Co., or TEPCO, which owns the plant. It will be months, at the earliest, before the entire perimeter of the facility has been fully frozen. The so-called ice wall will consist of a barrier of frozen soil encircling the nuclear plant. Pipes have been installed underground, stretching 100 feet beneath the surface for a distance of nearly a mile. Next, those pipes will carry a refrigerant that will chill the soil until it begins to freeze. The resulting ice wall is meant to address a pervasive challenge at Fukushima: contaminated groundwater. The facility is located between mountains and the ocean. Groundwater constantly flows from the higher ground toward the sea — passing beneath the nuclear power plant along the way. That means every day, there's newly contaminated water that has to be dealt with. Enormous quantities of water — reportedly more than 760,000 tons — have wound up in storage containers on site. A TEPCO video from 2014 shows the design of the ice wall. The ice wall is designed to block much of that groundwater from entering the facility and becoming contaminated in the first place. If all goes as planned, water arriving from the mountains will hit the ice wall and either freeze (helping to build the wall) or flow around it, hitting the ocean without passing beneath the leaking reactors. Water already contaminated at the site, meanwhile, should be contained within the wall. Once the wall is fully frozen, TEPCO officials expect to be able to extract the water from beneath the leaking turbines by 2020, the AP reports. The full decommissioning of the plant will take decades. The ice wall project has been criticized for its price — more than $300 million — the wire service says. And while smaller ice walls have been used before in other contexts, the AP calls this project "unprecedented" and notes some critics doubt the technology will work as planned. Meanwhile, as NPR's Geoff Brumfiel reported in 2013, some skeptics are concerned it could work too well, freezing so effectively that it decreases the amount of groundwater available in the area. As they prepare to activate the refrigeration system, Japanese leaders and TEPCO officials are sounding a cautious note. The nuclear agency's chairman, Sunichi Tanaka, tempered high expectations by telling reporters, "It would be best to think that natural phenomena don't work the way you would expect," the AP reports. "Asked ... if the ice wall is worth the cost, TEPCO accident response official Toshihiro Imai replied, 'Its effect is still unknown, because the expected outcome is based on simulations.' "